Gemini's UHF-4200HL Dual Wireless Headset/Lavalier System provides clear, accurate vocal reproduction without the burden of cables, ensuring wired limitations never force you to sacrifice passion or energy during a performance. 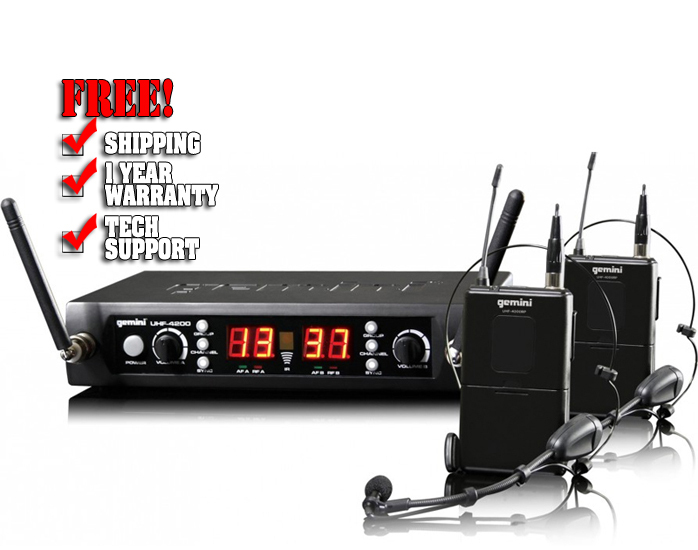 Ideal for DJs, presenters, fitness instructors, singers, MCs and anyone seeking a high-quality wireless headset or lavalier solution, the UHF-4200HL offers superior reliability and ultra-clear reception at a completely affordable price. Built to withstand the rigors of consistent use at events, meetings, auditoriums, fitness studios and houses of worship, the UHF-4200HL features robust dual 100-channel UHF receivers with a range of 250 feet. Using Phase Locked Loop (PLL) circuitry to prevent phasing issues that plague other wireless systems, both receivers are housed in a single discreet enclosure with a front panel Power button. Each receiver has individual rotary Volume control, along with Group and Channel adjustments for setting the desired frequency. RF and AF LED indicators also let you monitor incoming signal strength, while balanced XLR and unbalanced ¼-inch outputs offer true connecting convenience. The unit even gives you the option to set your frequency manually or allow the receiver to automatically find an optimal frequency. For outstanding versatility, the UHF-4200HL includes two comfortable and convertible lightweight headsets with detachable lavalier microphones. So, whether you're leading a fitness class or giving a presentation, this system has you covered. 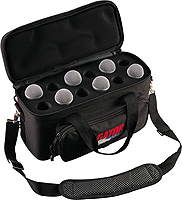 And to ensure exceptional audio quality, the UHF-4200HL's professional-grade microphones employ condenser elements with cardioid polar patterns and include foam inserts to reduce wind noise and popping. The discreet belt pack transmitters also provide convenient Power/Mute buttons and run on two AA batteries with up to eight hours of battery life. Why restrict your performance with wires when the UHF-4200HL gives you total freedom of mobility? Ditch the cables and let your natural energy electrify the crowd with this high-quality wireless solution.